Do not pick random topics, start with into and basics of Psychology. Selections of reading materials is very important, use very customize for your entrance. 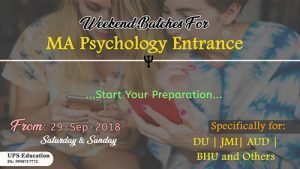 Dear Aspirants, We are going to start a new weekend Batch for MA/M.Sc Psychology Entrance 2019 Preparation, Admissions are open in this batch, and only limited seats are available. Batch will especially focused on DU, JMI, AUD, BHU and other well-known University. Register your self today for this batch. Timing of Classes with Notify soon. Article given below is very useful for all those, who are who are going to face their Entrance Examination for Admission in MA Psychology and M.Sc Psychology course. The very first thought comes in our mind about selection of colleges, which college will be best and where we should take admission for MA or M.Sc. Psychology course in India. Why it is become important; because we all know, a better University always allows you better opportunities. Watch the video link given below to know the best colleges in India for MA/M.Sc Psychology course. Other important thing is your preparation strategy, how does you prepare for your MA/M.Sc Psychology Entrance, have the gone through the right syllabus for the same, which books do you prefer. All these are major concept that will help in your entrance examination. According to our experts; Psychology is a very vast subject and there is number of theories and connects were presented by different-different psychologists. Which creates confusion for students, in this case only systematic approach of study and better guidance from your mentor can increase you chance of success. UPS Education is only institute in India, who provide assistance for Psychology Entrance examinations. Are you preparing for MA/M.Sc Psychology Entrance Examinations? Keep in mind that entrance dates is now very close and only few months are left for your exams. In these conditions, it’s become important to understand that what is to read and not because sometimes due to reading everything we face lots of problem in time management and due to lack of exact curriculum, we cannot make the right strategy. Practice through appropriate objective Questions for every topic. Solve sufficient Model Question Paper. It will help you to develop insight. 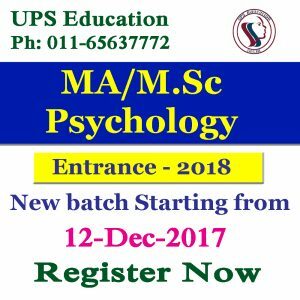 UPS Education is India’s No.1 Psychology Entrance Coaching institute; we provide both Regular classrooms coaching as well as Distance Learning mode coaching for MA/M.Sc Psychology Entrance. 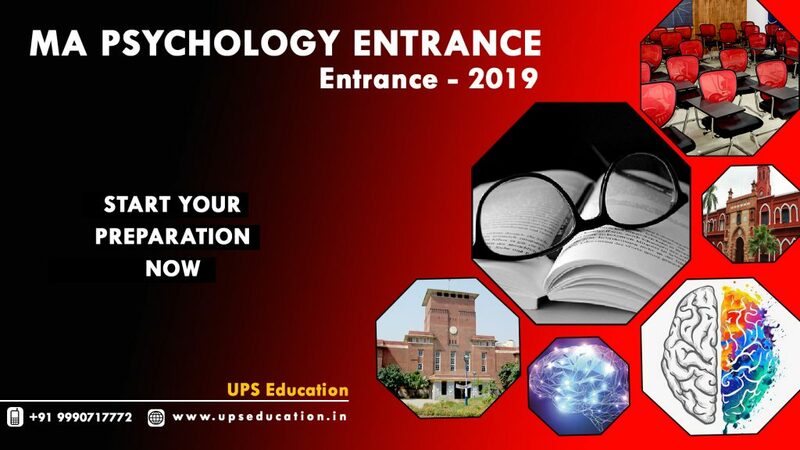 UPS Education is the right place for those students who are searching for an institute for their Psychology Entrance exams of MA/M.Sc Psychology Entrance, M.Phil Clinical Psychology Entrance and UGC-NET/JRF Psychology Exam. 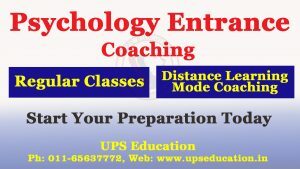 UPS Education stands only for Psychology Coaching and their attractive results and well educated (Gold Medalist) faculty make them India’s No.1 Institute for Psychology coaching. You may start your preparation for your psychology entrance exam with UPS Education through their Regular classroom coaching mode or Distance Learning Coaching mode. 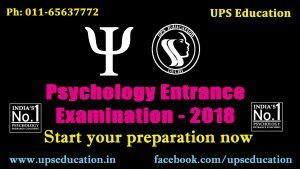 Exam Date for BHU MA/M.Sc Psychology Announced and will be held on (20-May-2018), application forms or Christ University is already out, so start your preparation as soon as possible because, competition is very tough; only systematic approach of study and regular practice through mock tests helps you in preparation. 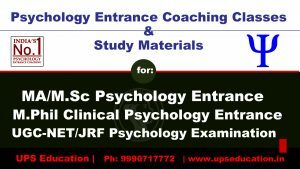 We have both regular classroom coaching as well as Distance Learning Coaching Mode for MA/M.Sc Psychology Entrance Examination, Join UPS Education today for your MA/M.Sc Psychology Entrance Exam and ensure your result. 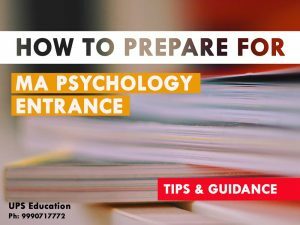 Are you ready for upcoming Psychology Entrance Examinations like: MA/M.Sc Psychology Entrance, M. Phil Clinical Psychology Entrance and UGC NET Examination? Don’t miss the chance to crack these exams this year. 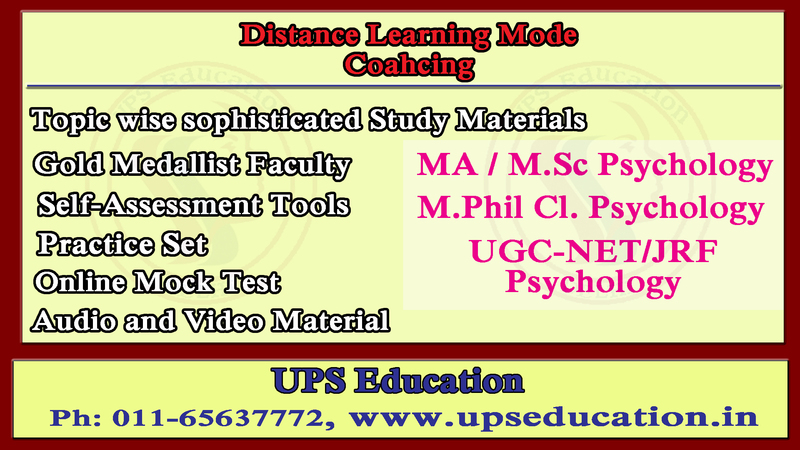 UPS Education provides Classroom Program as well as Distance Learning mode coaching for above entrance examinations. We organize online mock tests as well in our Distance Learning mode for the better practice of students; Start preparation with UPS Education Join our regular batch starting from 15-01-2018 or take admission in our distance learning mode coaching. Do you want to crack MA/M.Sc Psychology Entrance of 2018? 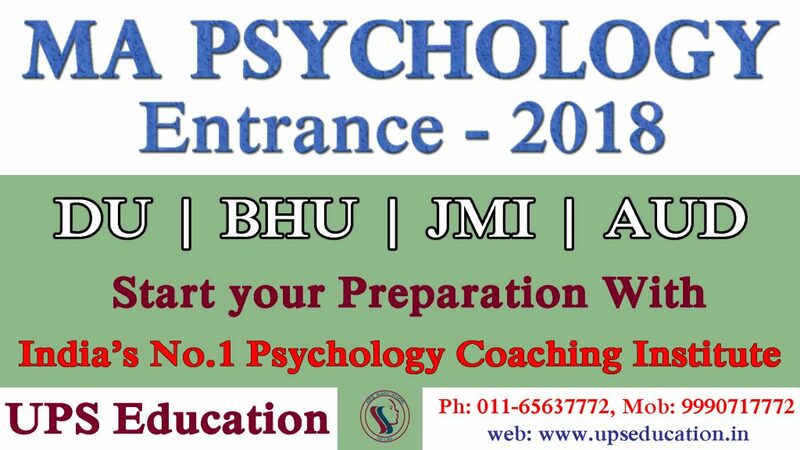 Is yes then Start your preparation now for MA Psychology Entrance Examination of 2018, this is the right time to start your preparation for Delhi University, Jamia Millia Islamia, Ambedkar University, Banaras Hindu University and other top most university in India for MA Psychology. 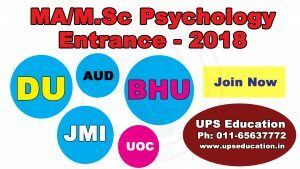 We are going to start our new batch from 12-December-2017 for MA/M.Sc Psychology Entrance, registration Process is already open. Register yourself as soon as possible.